An Antique Victorian Mahogany Partners Desk. This genuine antique Partners 'Desk has identical front and rear elevations - each comprising six drawers and a cupboard with vertical file dividers making for a most practical working arrangement. 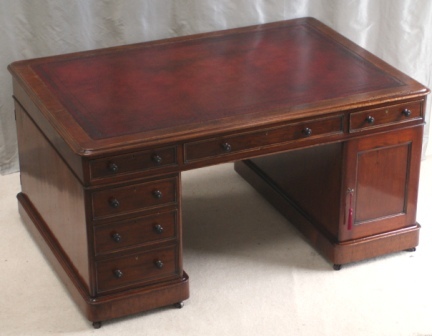 Of excellent proportions this Partners Desk has 17.5 square feet of working space, it has a magnificent dark red waxed leather writing surface and the whole desk is a deep rich shade of classic Victorian mahogany. Dating from the mid-Victorian period this traditional British Partners Desk provides an excellent working environment while being a handsome piece of antique office furniture in its own right. Rounded corners to pedestals, plinths and top, with ogee moulding. All frieze drawer heights = 3" (7.5cm).